Today, I am going to share a very healthy Murungai Keerai Thogaiyal/Drumstick Leaves Thogaiyal recipe from my kitchen. I have posted some interesting and healthy MurungaiKeerai recipes earlier like Murungai keerai soup, Murungaikeerai thanni, Murungai keerai sambar, Murungai keerai muttai poriyal and Murungaikeerai podi. 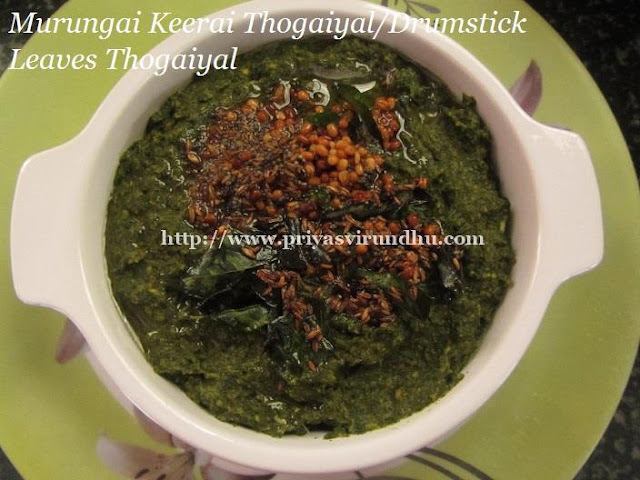 In addition to this exotic list I am adding another very healthy and tasty murungai keerai thogaiyal. Do try out this recipe and post your comments here. 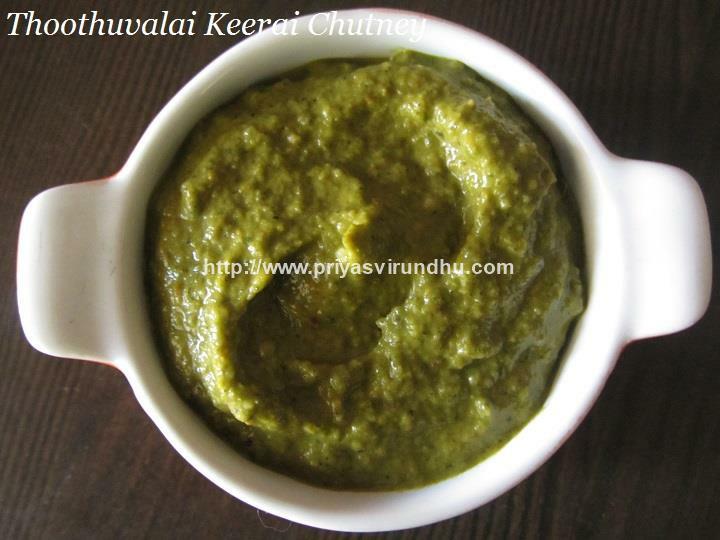 Meanwhile do check other interesting and delectable Chutney andThogaiyal Varieties here. Today, I am going to share a very healthy thokku, that’s comes in handy when you are actually tired of cooking. We have curry leaves tree/karuvepillai maram in my mom’s house, we trimmed down one branch of it, so I brought home a big bag of karuvepillai/curry leaves. I mdae this delicious and finger licking thokku which I am sharing with you all. Check out other karuvepillai recipes I have posted earlier in the links - karuvepillai Poondu kuzhambu, karuvepillai podi, karuvepillai kuzhambu for bachelors [easy version], Do try out this Karuvepillai thokku will taste exactly like the A2B one and have a great day. Murungai Keerai thanni is one of my favorite recipes that my mom makes very often. It is usually very difficult to make kids eat the greens, but when we make this keerai thanni and give, they will just love it. I love the fresh murungai keerai/drumstick leaves which we get in our backyard [organic], cook it with kazhani thanni [rice washed water] along with onions, green chilles and the final touch of adding coconut milk is just amazing. We usually make this for lunch and serve with steam cooked white rice. In my earlier post I have shared about the health benefits of Murungai Keerai, I would love to mention it here as well. Drumstick leaves have wonderful medicinal properties. They have essential amino acids for the healthy functioning of our body. Regular consumption of drumstick leaves is highly recommended for anemic people. They are rich sources of antioxidants, proteins, potassium, vitamin A, C, B3, B2, iron and magnesium. They help in maintaining the blood sugar levels. Keeping all the health benefits in mind do try out the Murungai Keerai Thanni and post your feedback here. Meanwhile do check out other interesting MurugaiKeerai Recipes like Drumstick LeafPowder/Murungai Keerai Powder, Murungai Keerai Soup, Murungai Keerai MuttaiPoriyal, Murungai Keerai Sambar. Do not forget to check out other interesting Vegetarian gravies here. 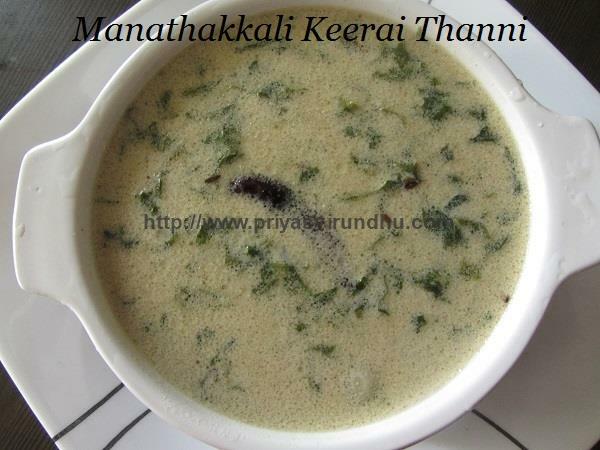 Also do not forget to checkout Manathakkali Keerai Thanni recipe here. Today I am going to share a very tempting Keerai Masal Vadai. Keerai vadai can be made with either urad dal or channa dal. 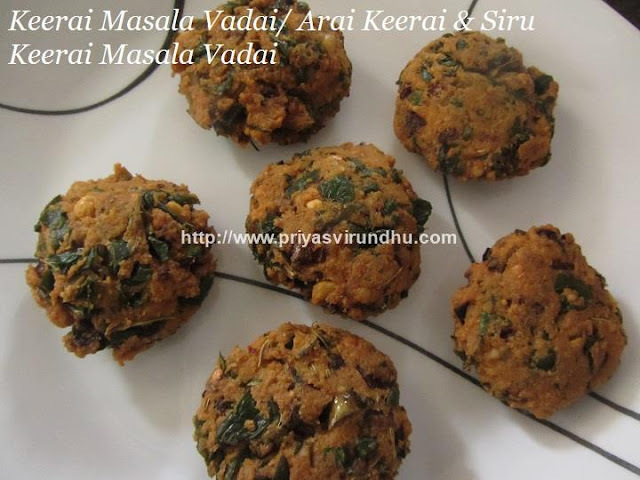 I have already posted keerai vadai made with Urad dal. This Keerai vadai is made with channa dal along with Arai keerai and Siru keerai. You can choose Keerai Variety of your choice and this surely is one short cut method to get your kids to eat greens. Do try out this Keerai Vadai and post your comments here. Meanwhile do check out other Evening Snacks and Vadai Varieties here. Here’s how to make Keerai Vadai with step by step photos…. 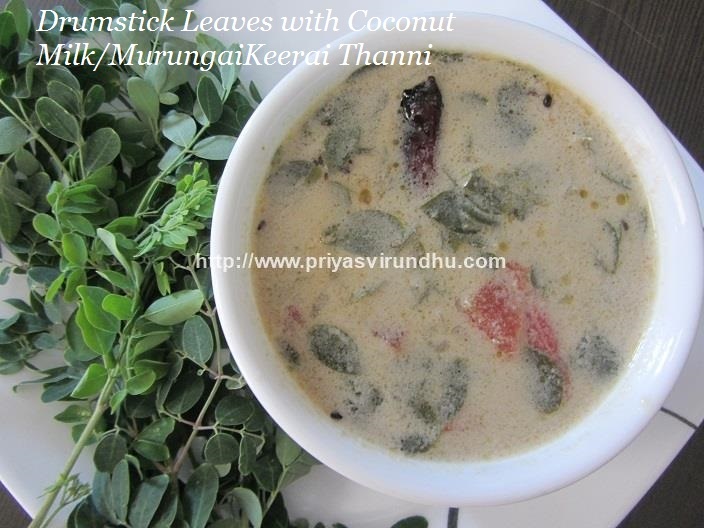 Murungai Keerai/Drumstick Leaves soup is a simple and healthy vegetarian soup that can be made in a jiffy. Drumstick leaves have wonderful medicinal properties. They contain all essential amino acids for the healthy functioning of our body. Regular consumption of drumstick leaves is highly recommended for anemic people. They are rich sources of antioxidants, proteins, potassium, vitamin A, C, B3, B2, iron and magnesium. Drumstick leaves helps in managing blood sugar levels. Regular consumption of drumstick leaves powder/murungaikeerai podi consumed regularly helps in managing blood sugar level. Do try out this healthy and flavourful soup and post your comment here. 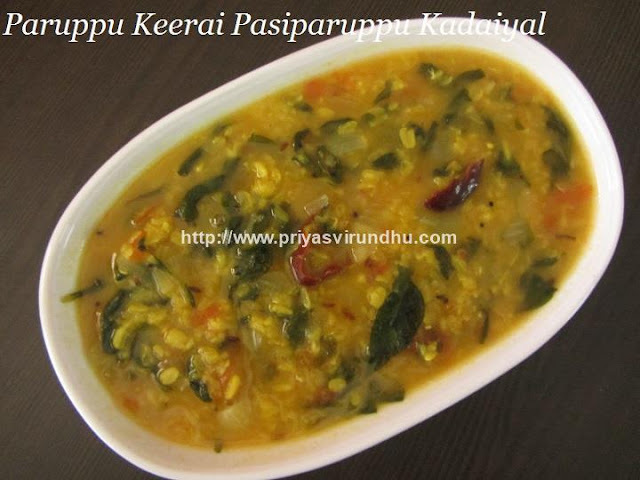 Meanwhile do check out other interesting and healthy murungai keerai recipes here. 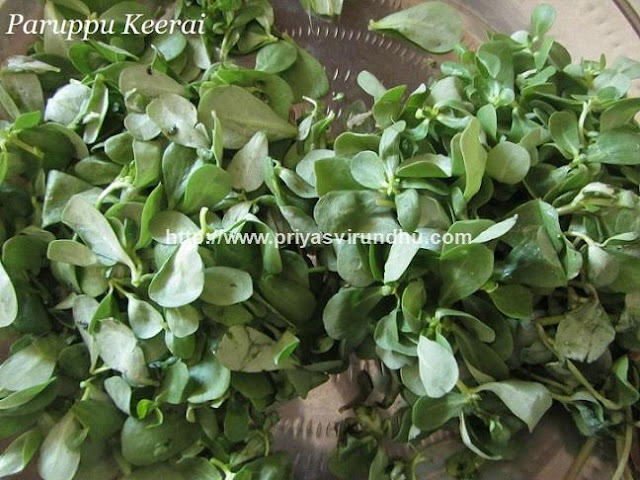 Before going into the recipe I would to share a little about ParuppuKeerai/Purslane/Verdolagas which I googled and read about in various websites[specialityproduce, Wikipedia, nutrition and you etc]. Though I have been eating this paruppu keerai since I was a kid, I was really surprised to read a lot of interesting facts and how it’s been used all over the world. The greens which I am sharing here is called as Paruppu Keerai in Tamil, Purslane in English and Verdolagas in Spanish and is very common in central Mexico. The stem, leaves and the beautiful yellow flowers of paruppu keerai/verdolagas are all edible and have a slightly salty, slightly tangy and acidic flavor. The slight tangy taste adds up great taste when we make soups and stir fries, and its juicy leaves can be used to add texture to salads. Purslane/Paruppu Keerai is very common around world, in Mexican cuisine they are commonly paired with pork, tamales, stews and eggs. In Japan it is commonly pickled and served with rice. In Russia, Turkey and Lebanon it is used in a variety of salads ranging from tabbouleh to potato salad. It has long been used in Chinese medicine. In South India, they are cooked with dals, stir fries, soups etc. Paruppu Keerai/Purslane is rich in potassium and magnesium. The soft, succulent leaves are rich in Omega -3 fatty acids which help in lowering blood pressure and regulate cholesterol levels. This wonderful green leaves are rich in dietary fiber, vitamins and minerals. It is an excellent source of Vitamin A , C and some B-complex vitamins like riboflavin, niacin, pyridoxine and carotenoids as well as dietary minerals such as iron, magnesium, potassium and manganese. With this, I think it’s time for me to move on to the recipe. Do try out this Paruppu Keerai/Verdolagas pasiparuppu kadaiyal and post your comments here. 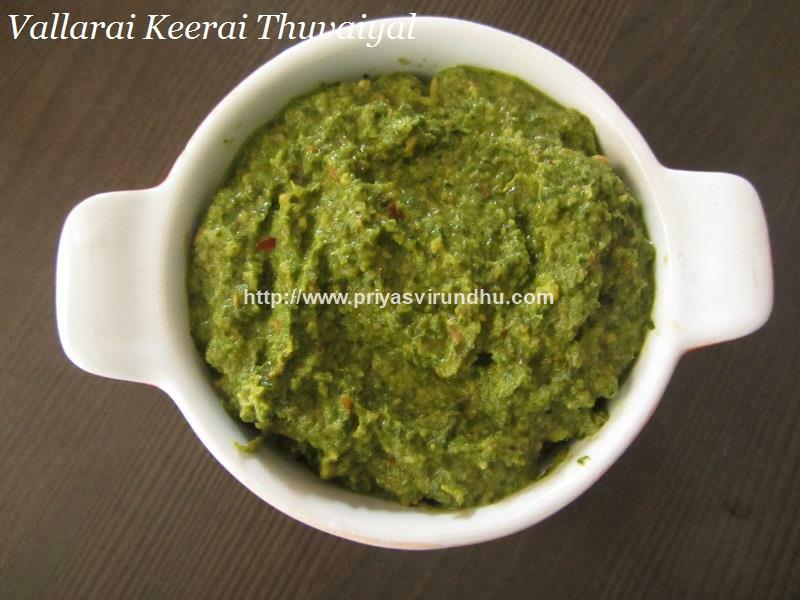 Meanwhile do check out other interestingKeerai recipes and different varieties of Greens/Keerais here. 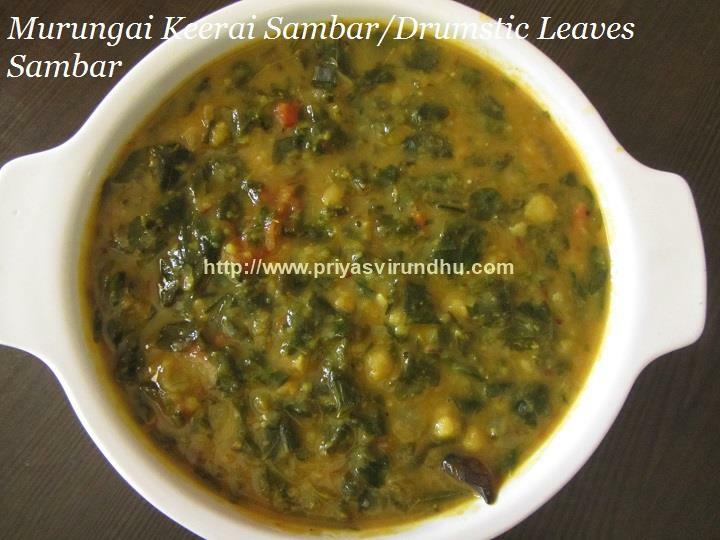 I started to post recipes with drumstick leaves/murungaikeerai, and promised to post more of murungai keerai recipes. 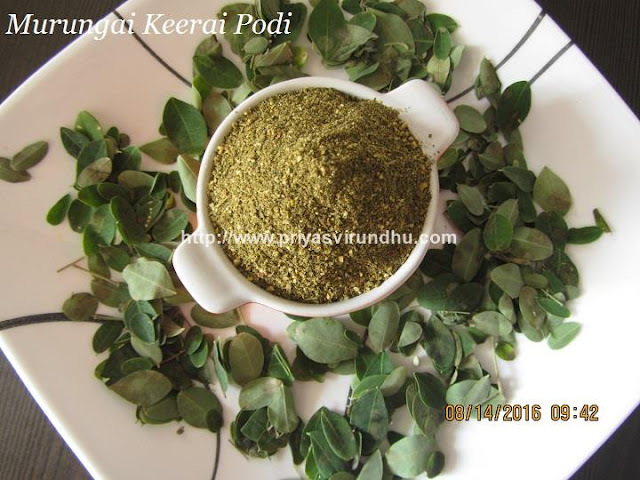 As promised, I have come up with murungai keerai podi/drum stick leaves powder, which is a very healthy recipe and can be had with white rice or as side dish for idlis and dosas. Murungai keerai has n number of health benefits which I have shared here also. When drumstick leaves are consumed along with pure ghee, they stimulate the blood circulation in the body to induce the re-growth of hair folliciles. Consumption of drumstick leaves are advised for ladies and girls suffering from calcium deficiency and insufficient iron in the blood. These leaves improve the defence mechanism in our body and thus fight against many types of infections. The antimicrobial properties of drumstick leaves cure throat, chest and many types of skin infections. Having said all this now let’s move on to see this easy and healthy drumstick leaves powder/murungai keerai powder. 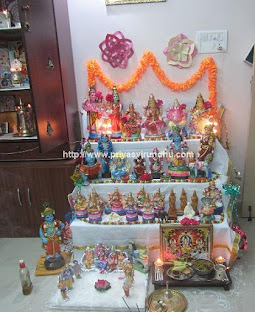 Meanwhile do check out murungai keeraisambar and murungai keerai egg poriyal which I have posted earlier. Today I am going to share a very healthy and loving recipe – murungai keerai sambar from my kitchen. We have Murugaikeerai tree[mom’s house] in our backyard, so I have decided to share lot more drumstick leaves recipe in the following post. If you have murugai keerai tree in your back yard it means you have a doctor at home. It has excellent medicinal values and is a cure for lots of diseases. It has the amazing healing power to cure wounds inside the stomach, reduces headache and bloody diarrhea. Murungaikeerai purifies our blood and excretes all the toxins out of our body. It is an excellent source of calcium and helps in building stronger bones and teeth. They also contain abundant amount of potassium which plays a vital role in brain development. I have shared a few benefits of murungai keerai in this post and will be sharing more benefits about the same in the upcoming post. For now, do try out this wonderful, traditional and authentic murungaikeerai sambar and post your comments here. Mean while do not forget to check out other sambar varieties here. Here’s how to make Murungaikeerai Sambar…. 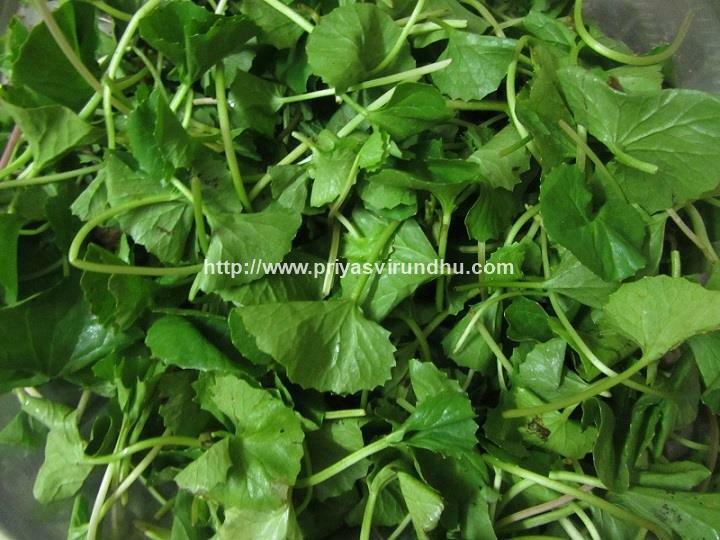 Mudakathan Keerai/Balloon Vines Leaves is a very popular keerai variety in TamilNady used for treating joint pains. Usually compresses are prepared using mudakathan keerai and applied on joints for the pain. Herbal hair oils are also prepared with mudakathan keerai which helps to fight dandruff. 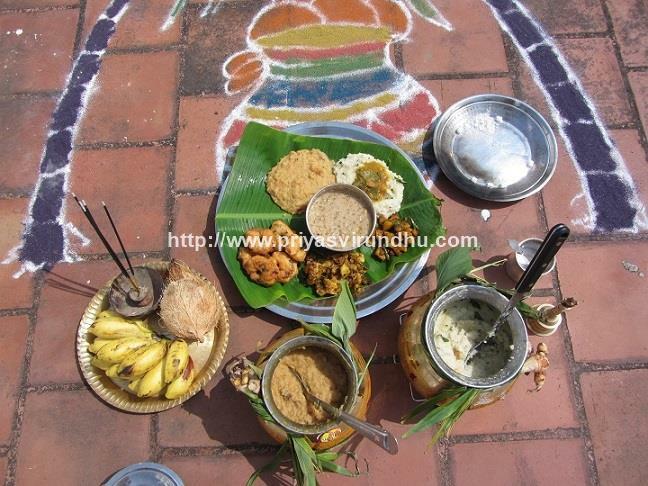 Other common recipes that are prepared are Mudakathan Keerai Dosai, Mudakathan Keerai Soup, Mudakathan Keerai Kuzhambu etc. For now I am sharing Mudakathan Keerai Kara Kuzhambu with you all, please try it out friends and reap the benefits of the same. Meanwhile do not forget to check out other interesting South Indian Kuzhambu varieties here. Thoothuvalai Keerai [Solanum Trilobatum] is an excellent herb with numerous and amazing health benefits. It is used in treating common cold, cough and to get rid of phlegm in our chest. Thoothuvalai is basically a thorny creeper with purple flowers and red fruits and grows really very fast. Thoothuvalai creeper has lots of thorns in the leaves, so when your plucking it, you should be very careful. My best advice is to use scissors when cleaning the leaves. 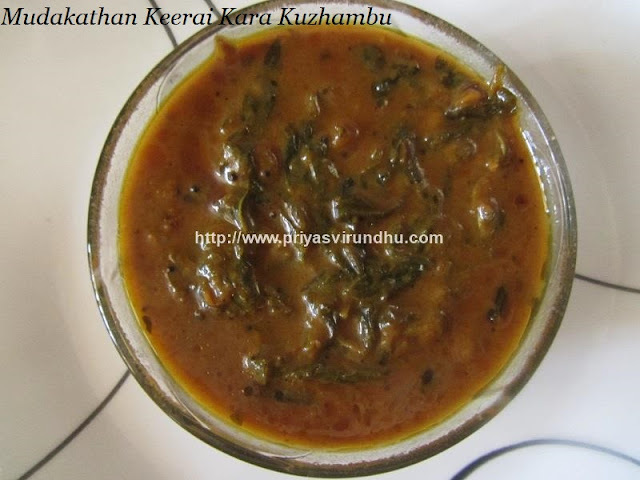 Many recipes like thoothuvalai kashayam, thoothuvalai rasam etc are made in many households. Thoothuvalai is available in vegetable markets or from street vendors, but I pluck it from my mom’s garden whenever I get a chance. 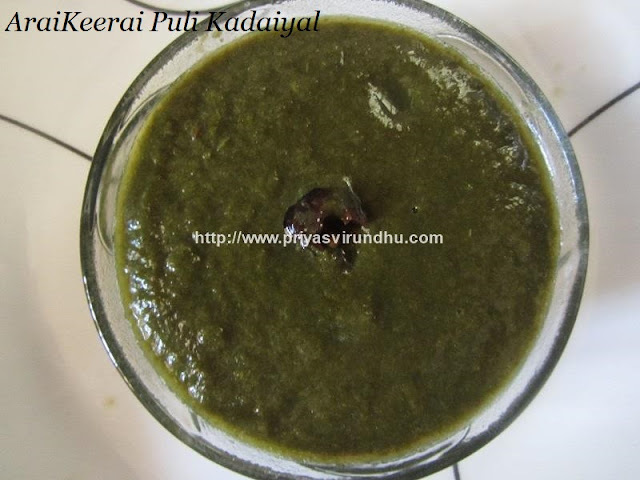 For now, I am sharing Thoothuvalai Keerai Chutney which is an excellent side dish for idlis and dosas. I know Thoothuvalai is not available in most of the places, but if you come across or get a chance, then do try to make some chutney and reap the benefits of the same. Meanwhile, do check out other interesting and tempting chutney varieties here. Today I am going to share with you all a very healthy and nutritious Araikeerai Puli Kadaiyal. This puli kadaiyal recipe is super tasty, tangy and spicy, everything in right amount. Araikeerai/Amaranthus Tristis, like any other green is loaded with iron, calcium, anitoxidants and other vitamins and minerals. Araikeerai is an excellent remedy for cold, cough, immunity and builds strength in our body. It is said to play a vital role in helping people suffering from neuritis/nerve related problems. I have read in one of the Ayurvedic books which states that, if araikeerai is included in our diet everyday it helps in curing long term diseases like cervical spondylosis, nerve pain, head ache, migrane etc. For this a very strict diet containing araikeerai kadaiyal and pepper rasam has to be followed every day. [Ref from Book: Nattu Moolikaigal by Dr. Venkatesan]. With this short note let us move on to the recipe. Do not forget to try this araikeerai puli kadaiyal and post your feedback here. Today I am going to share with you all glossary of keerai varieties/Greens in English and Tamil. 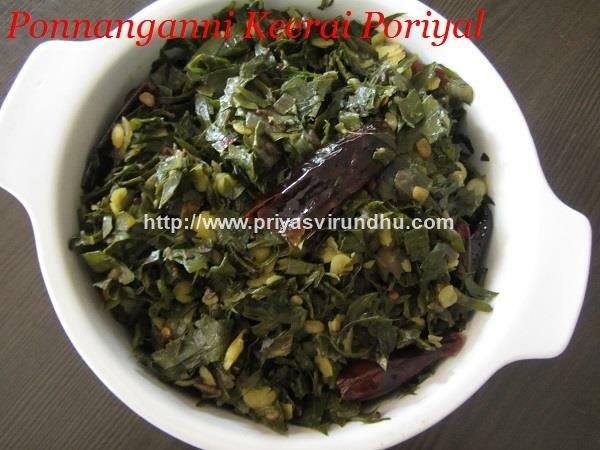 I have arranged the glossary with photos of keerai/greens, will be updating when ever possible as well. Please give me more suggestions and other different varieties of keerai/greens. Today, I am going to share a very aromatic, healthy and a wonderful evening snack – Karpooravalli Bajji. 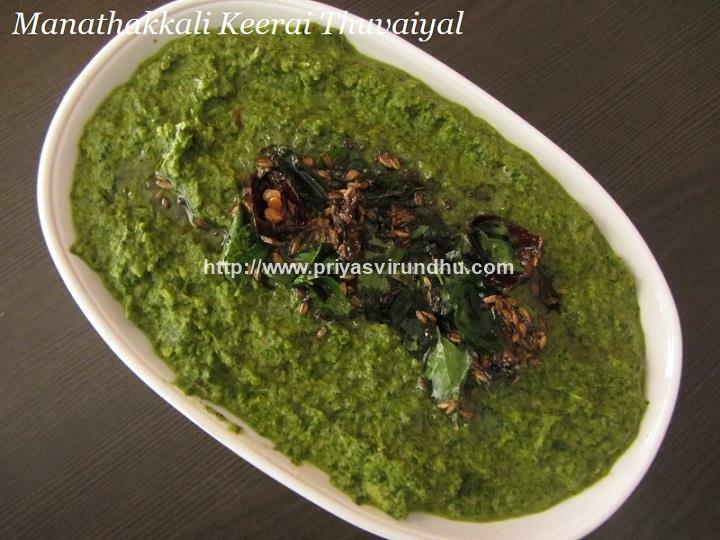 I have already posted karpooravalli thuvaiyal, which is another interesting and healthy recipe which you all must try. Do check it out in the link. 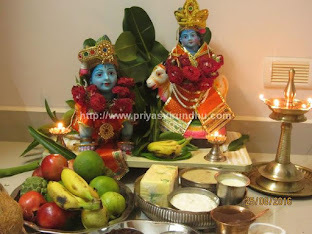 Feeding the kids karpooravalli is a real challenge, but make this karpooravalli bajji and the kids will surely love it. Do try it out friends and have a great week end. Do check out other interesting appetizers/starters in the link and enjoy. Manathakkali keerai/Black nightshade has numerous medicinal properties. It is rich in antioxidants, iron, vitamins, minerals and loaded with calcium. The amount of phosphorous present in it helps in the growth and development of brain nerves. Manathakkkali Keerai is an excellent cure for mouth ulcers and stomach ulcers. In Tamil medicine it said that you should consume the manathakkali keerai raw leaves [7-8] in the morning in empty stomach. This is an excellent remedy and cure for stomach and mouth ulcers. This manathakkali keerai thanni, prepared with coconut milk is my grandma’s recipe. AfterI got married, when I made this recipe [about 13 years back], my husband and my inlaws were surprised, it was really new to them and they loved it. 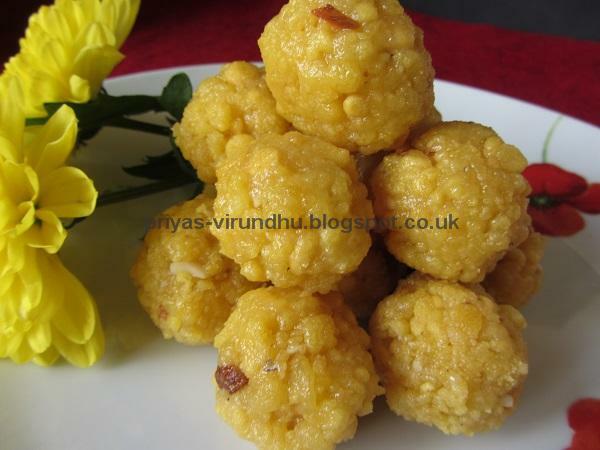 Anyway friends try out this keerai thanni and post your comments. This keerai thanni or soup can be made with agathi keerai or murungai keerai which also has unique and wonderful taste.Do not forget to check out other keerai varieties here. Vallarai is known for its brain boosting abilities and to cure many diseases in Ayurveda and Siddha treatment since the ancient period. Vallarai is used to revitalize the brain and nervous system, increase attention and concentration, and combat aging. The extract from Vallarai is used in treating memory enhancement and neurodegenerative disorders. Vallarai has amazing medicinal properties which help in fighting many diseases. It plays a vital role in treatment of Alzheimer’s disease and brain related problems like insomnia. Vallarai has wonderful properties, which helps in curing skin problems like eczema, leprosy, psoriasis and ulcers. Vallarai helps in relaxing muscles and alleviates menstrual pain and disorders. It promotes youthful vitality and longevity and prevents early greying of hair. Hair fall and premature greying of hair can be controlled by using vallarai oil which is readily available in Ayurveda shops. Vallarai acts as a great cure for joint pain or inflammation, rheumatism, arthritis etc. Not just the above mentioned benefits, vallarai has many other medicinal values and properties and the list goes on. The above information is collected from various websites like Wikipedia, ayurvedictalk.com etc. For people who live outside India can buy the vallarai tablets from Ayurveda shops when you visit Chennai and consume it. For now I am going to share Vallarai Thuvaiyal, do try it out friends and enjoy the benefits of Vallarai. Meanwhile friends, do not forget to check out other chuteny/thuvaiyal varieties here. 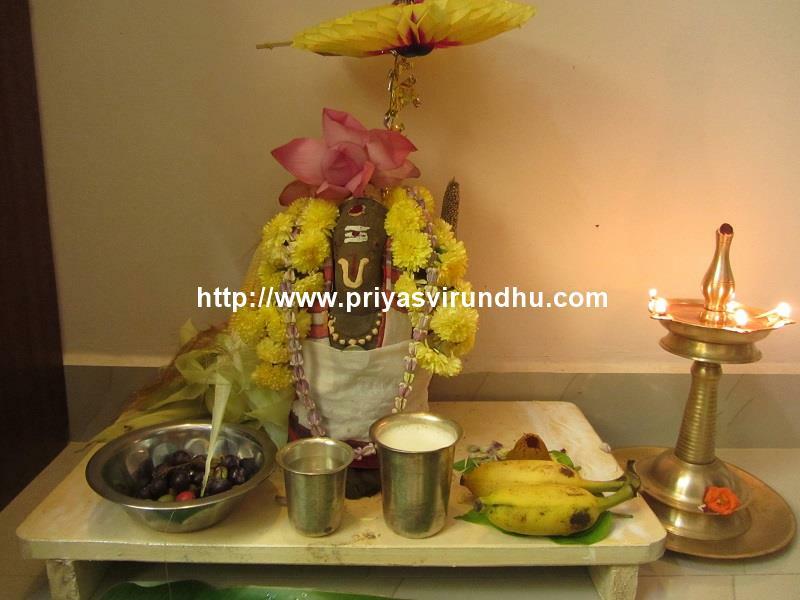 Here’s how to make Vallarai Keerai Thuvaiyal with step by step photos…. Today I am going to share a very interesting chapathi made with dal and greens. 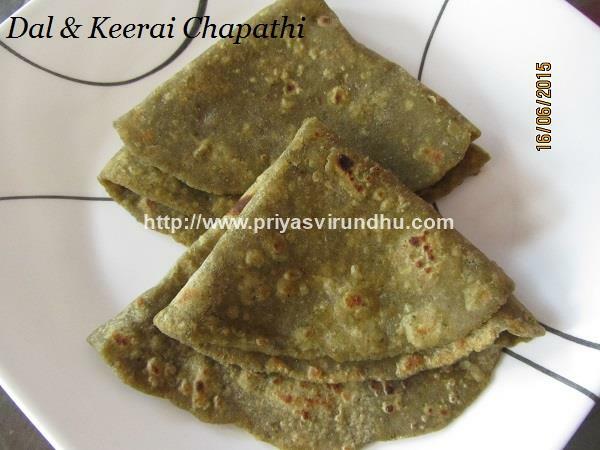 The choice of greens is totally your’s, I have used araikeerai to make this chapathi. I always come across one problem when packing lunch, my husband and elder daughter prefer to have rice for lunch and my little one always will prefer to have chapathis or rotis etc. Whenever I make paruppu keerai masiyal or any other green varieties my little daughter never has it during lunch, and I used to feel very bad about it. But then whenever I make paruppu keerai during weekdays for lunch, I blend the prepared keerai and make chapathis for her. But for my husband and elder daughter I make rice, mix this dal and prepare some vegetables and pack the lunch. I think lot of moms must be coming across this kind of problem when packing lunch for your whole family, but when you go by my idea you will feel happy and satisfied. One best part of it is your kid will eat all the chapathis and she/he will get the greens also. Meanwhile friends, do not forget to check out other interesting and delicious breakfastvarieties here. The scientific name of Thoothuvalai Keerai is Solanum Trilobatum. Thoothuvalai keerai has lots of health benefits and is commonly used for treating cold, cough, throat infections and acute asthma. 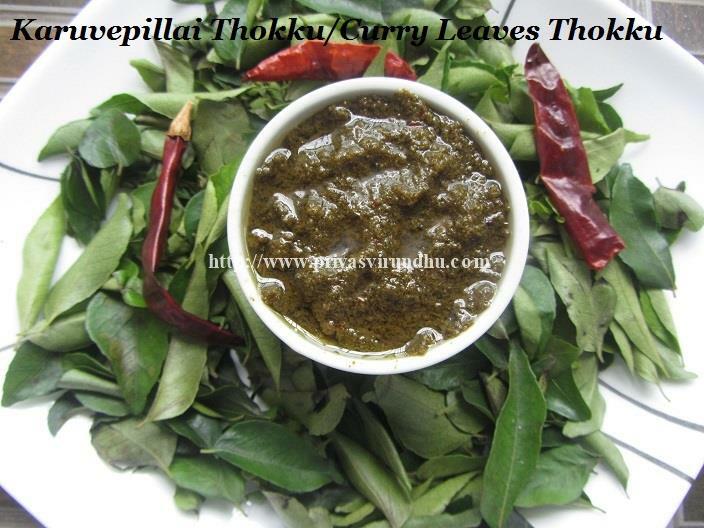 Thoothuvalai leaves can be used for preparing thoothuvalai chutney, thuvaiyal, dosai, candy etc. Thoothuvalai keerai can be roasted in ghee, powdered and added to hot steaming rice for respiratory problems and as sinus cure. 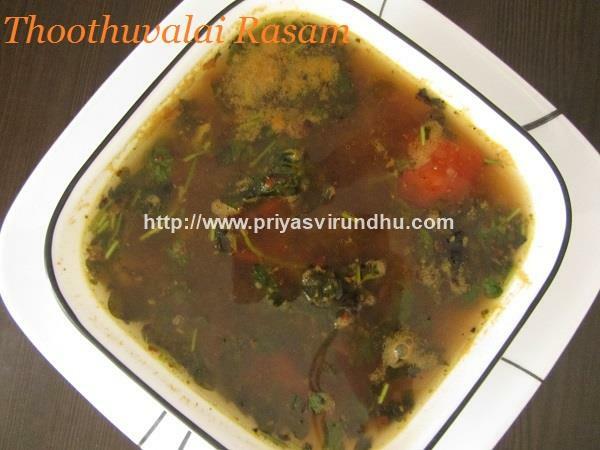 For now I am going to share Thoothuvalai Keerai Rasam, do try it out and post your comments. Please check out other interesting “RASAM VARIETIES” here. Ponnanganni Keerai is called as “Dwarf Copperleaf” in English, is a green variety available throughout the year. The name “Ponnanganni” means glow like gold. It is loaded with iron, calcium and other vital nutrients that make our hair and skin glow. When Ponnanganni is taken for a period of 48 days regularly, it heals our body of all kinds of deficiency and reduces the body heat, as it is an excellent body coolant. Ponnanganni is specifically recommended for eye ailments, asthma, gonorrhoea, syphilis. Most of them avoid these types of greens, because they do not know how to cook them or to use them. A very simple ponnanganni keerai poriyal/stir fry included twice or thrice a week in our diet is a wonderful remedy to stay healthy. Ponnanganni oil/thailam is very famous in Tamil Nadu and is used for treating headaches and also for treating excessive body heat during the summer months. 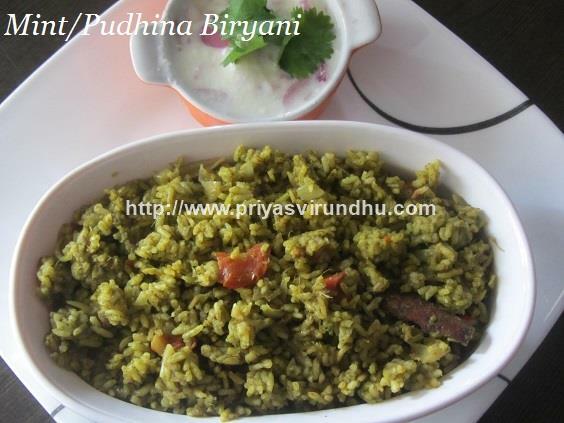 For now friends I am going to share this Ponnanganni Keerai poriyal, do try it for sure and post your comments.